I actually miss these frogs when they don't show. In the morning, about an hour before sunrise I hear them approach. They herald their presence with a soft thwack against the house. Usually it's against the windows. Then all is peaceful and what passes for quiet here. We share our house with these frogs. They're entertaining to watch. I have a small cavity between the windows on the back of the house. Lined with plexglas on our side, its wide enough for you to slide your fingers into with a little room to spare. 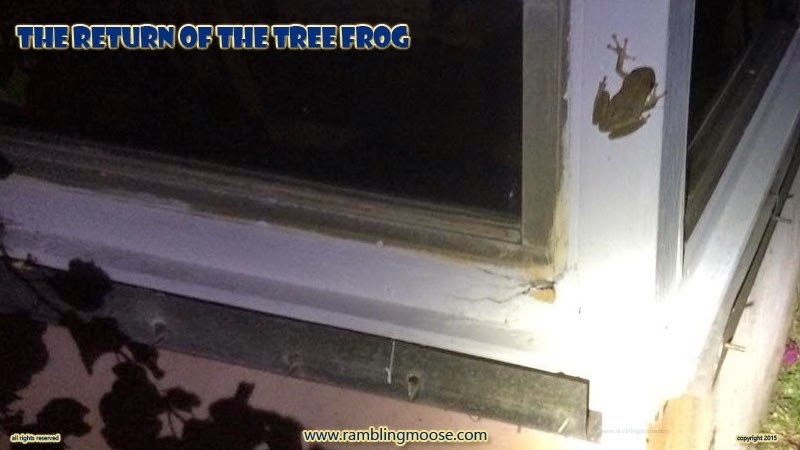 The tree frogs found the spot a couple years back and I get visitors from time to time. The thwack of their bodies announcing their presence as they sidle into position for a daytime sleep. In this case there was a conversation it caused here. "Just the tree frogs. They're home for the night." "Don't they usually come here to sleep all daytime?" "Yes, but it's out of sync. It will be fine, it's probably just repositioning itself for whatever work a tree frog does". At that point, it was announced that I was going to get my picture via email since someone went on a backyard safari. "Watch for the opossums, have fun, and don't disturb my guests!" This picture was the result. It reminded me of some strange B Movie quality in ways, but that's what you get from an iPhone. They were staying with us for a long block of time, a full season plus a bit. I guess in the warmer weather, the cool from our house leaking through the single paned plastic was a welcome respite from the heat. Enjoy it while it lasts my little friend, and do give our best to Miss Piggy. As for the track below? One of my favorite early trance tracks. "Tree Frog" by Hope. Plus it's got some pretty cool pictures of a green tree frog doing it's thing repeated throughout.